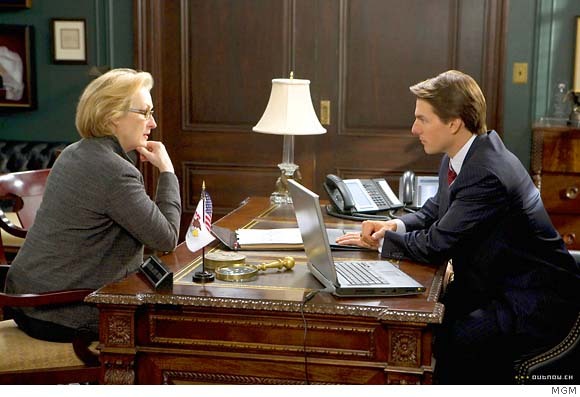 A liberal talk-a-thon is how most critics have described director Robert Redford’s Lions for Lambs, the first studio release under the watch of Tom Cruise and production partner Paula Wagner. Fittingly enough the highly verbal characters do talk enough to rival a sewing circle and perhaps instead of referencing an obscure twentieth century war quote that moviegoers may have trouble remembering, the film’s alternate title could have been How to Make an Antiwar Quilt. Following up his script for his similarly topical Middle East themed Jennifer Garner starrer The Kingdom which was directed by Peter Berg who also shows up in Lions, writer Matthew Michael Carnahan crafted a more cerebral work about the war on terror filled less with action than with controversy, sound bytes, and hypothetical what if’s that rival the heyday of CNN’s Crossfire. The Opening Night Gala film at the 2007 American Film Institute Festival, Lions for Lambs is the latest in a series of films that have crashed and burned at the box office indicating American filmgoers’ lack of appetite for movies dealing with the wars in Iraq and Afghanistan and while it is ultimately filled with words that don’t speak as loudly as some of the film’s bursts of action, it’s filled with tremendous turns by its stellar cast. Tom Cruise picks up where his character in Magnolia left off as a handsome, polished and arrogant GOP senator who wields his charisma like a weapon in his near film-long interview with journalist Meryl Streep whom he invites to share his new risky strategy for the war in Afghanistan. Meanwhile we’re introduced to a privileged, brainy and apathetic college student called to the office of liberal professor Robert Redford to try and engage the young man whose formerly spirited debates marked him as a scholar to watch. Redford tells the student of the last two young men who’d inspired him who attended the university on a scholarship only to volunteer for military duty in Afghanistan. The flashbacks of Michael Pena and Derek Luke as two forthright and heroic young men mark the high points of the film and tensely effective editing is employed as the talk is intercut with the plight of the two students now soldiers being affected by all of the new strategies and issues discussed in the comfort of air-conditioned rooms in America as they fight in the Middle East. Ultimately as John Wildman wrote in the AFI publication, “…arguments, memories and bullets fly…” and the talky film is an antidote to most war films but we’re nonetheless left with an unsettling feeling as the conversational circles which we all know cannot result in a quick fix are just kind of tossed aside for a quick finale that goes for a cynical punch right to the gut. Even though we know that nothing will change, Redford’s character had us believing that a slight difference could be made by concerned citizens but still, in the end, the two endearing characters we find ourselves most inspired by are not the academic, politician or writer but two young soldiers who take action because they feel they have been failed by words.